This is a yummy and mouthwatering dish…. 13. Sesame oil / Vegetable oil – as required. 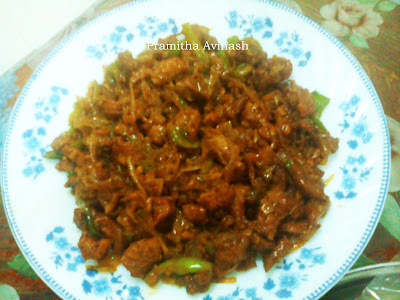 1.Marinate the beef strips with the ingredients from 1 to 6 and keep it aside for 10-15 mins. 2. 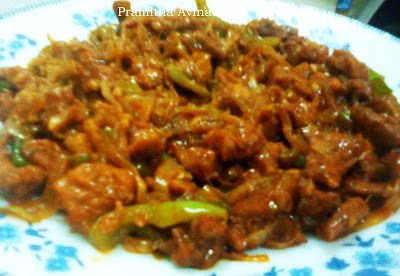 Pressure cook the marinated beef till it is done(3 whistles is enough to be done,varies depends upon the beef you use). I usually dont add water while cooking,if u want you can add 1-2tbs of water. 3.When it is cooked,keep the beef and stock separately. 4.Now heat oil in a non stick pan and stir fry the sliced onion , split green chilli’s , capsicum with 1 tbs of soyasauce for 2 minutes and keep it aside. 5.In the balance oil,stir fry chopped ginger & garlic with the cooked beef,fry it for 2-3 minutes.Now again add 1tbs soyasauce, 1tbs chilli sauce & sugar and fry for a minute. 6.Now add the beef stock and cornflour mix,continue till it get dry. 7.When it is done,add the fried ingredients and stir it. You can have this yummy dish with parathas,chapathi….